Quito, May 25 (Andes).- President Lenin Moreno received Thursday the ancestral baton during a ceremony that took place at the ancestral pyramids of Cochasqui, located in canton Pedro Moncayo, in the northern area of the province of Pichincha. 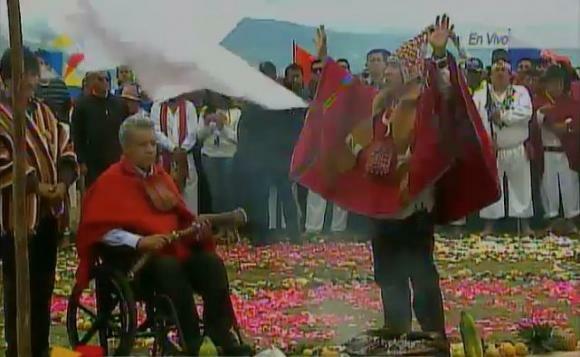 Elder women and men from different indigenous peoples and nationalities of Ecuador were in charge of leading this ritual where they used incense and aromatic essences to energize ministers, secretaries and assembly members who attended the event. With ancestral instruments, taitas and mamas (fathers and mothers) recharged the Earth’s energy, knowledge and good wishes in for President Lenin Moreno and vice president Jorge Glas to head in good direction. The ritual, according to indigenous people, connects the physical with the spiritual areas. Therefore, they used things that represent the four elements: earth, air, water and fire. Dry beans are placed in the center of the sacred circle as well as clay pots filled with water and ancestral herbs like chuquiragua, which is grown in the Andes. Bolivia’s president Evo Morales and Moreno’s wife Rocio Gonzalez attended the event. All of them swore ponchos that are symbol of brotherhood. The attendees raised their hands to concentrate their energy and transmit it to the president for him to lead the nation with peace and in harmony. The new president said he was really happy to attend a ceremony like this with indigenous peoples and nationalities of the country, an important ritual that shows that the government will always work for their well-being. “Today I receive the baton which is not mine, it is borrowed from peoples and nationalities who might be saying Lenin we will not forgive you if you betray us,” Moreno said. He highlighted that his government will always listen to their requests. For his part, Morales thanked Moreno and Ecuadorians for inviting him to the ceremony and said he was “amazed at this event. This is an opportunity to strengthen our culture, to strengthen our peoples,” he said. “I want to take advantage of this opportunity to call on unity since it will be the solution to our peoples, peoples that were threatened to be exterminated by liberal governments. I support my brother Lenin Moreno, much strength, commitment and energy. Long live Ecuador,” Morales concluded. One of the programs Moreno offered to create during his campaign was also signed in the event. The project aims at protecting the lives of people since their birth mainly focusing on children, adolescents, people with disability, the elderly and pregnant women.